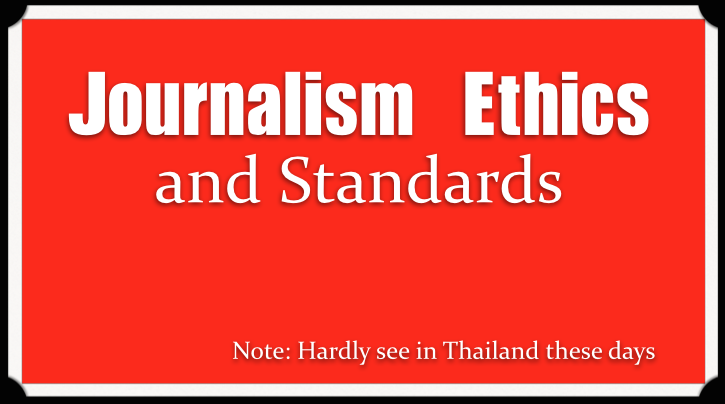 Journalism ethics and standards comprise principles of ethics and of good practice as applicable to the specific challenges faced by journalists. It is considered to be subset of media ethics. There are various codes with differences, but most share common elements including the principles of truthfulness, accuracy, objectivity, impartiality, fairness and public accountability, as these apply to the acquisition of newsworthy information and its subsequent dissemination to the public. Like many broader ethical systems, journalism ethics include the principle of "limitation of harm". This often involves the withholding of certain details from reports such as the names victims or information not materially related to particular news reports release of which might, for example harm someone's reputation. Discriminatory also included in some of codes with references in news based on race, religion, sexual orientation, and physical or mental disabilities. Sadly, many of Thai reporters lacked of those basics, and very often created new conflicts in society.